SLICE Ann Arbor is a weekly arts and culture blog featuring slice-of-life interviews with people making a creative mark in and around town. Meet the artists, chefs, designers, musicians, actors, playwrights, architects, producers, curators, photographers, dancers, filmmakers, and authors—and find out how they got their start, what’s important to them, and why they do what they do. Sounds pretty cool. 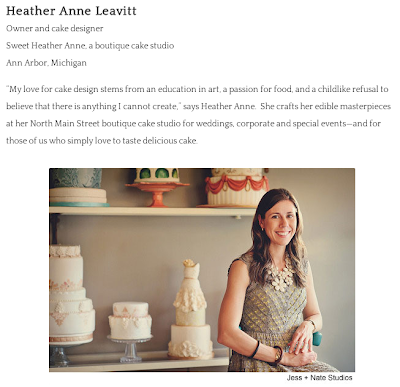 One of their first articles is an interview with Heather Anne Leavitt, of Sweet Heather Anne's. Sounds like things are going pretty well for her. This blog will only gain legitimacy when it interviews *you*, BCB. I know that's what really helped pull MarkMaynard.com from obscurity. where are the bylines on this new website? I want to know who's doing it and why.